In the 16th and 17th centuries the harp was a popular instrument, especially in Spain and Italy. In Spain the harp became a chromatic instrument in the mid-16th century by adding an order of chromatic strings interwoven or intertwined with the diatonic ones. It seems to have been an exclusively Spanish thing and not to have been used elsewhere. 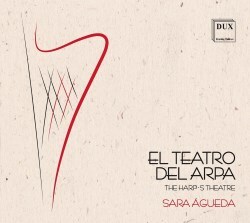 The harp was used as a solo instrument and for the accompaniment of singers. Most vocal pieces are from the pen of Juan Hidalgo, himself a harpist, and the main composer of music for the theatre of the 17th century. The work-list in New Grove includes works for the stage but also "secular and theatre songs". The booklet does not indicate where these songs come from, and whether they were intended as independent pieces or were part of a theatrical play. Far less known is Juan Serqueira de Lima, a guitarist and harpist of Portuguese birth, who for most of his life worked in Spain. According to New Grove "Serqueira was the most prestigious and talented theatre musician of his time in Spain, working for companies in Madrid for nearly 50 years."